Adding a border to a Powerpoint presentation makes your presentation visually appealing look, which will capture your audience’s attention. 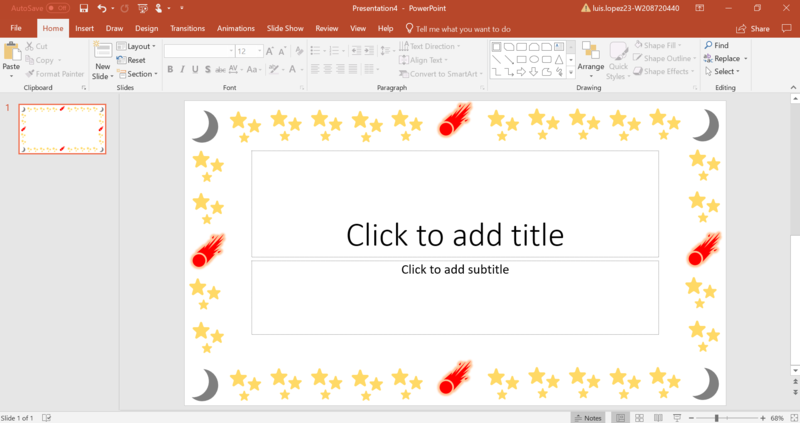 You can create just about any look you want, whether you want a rocket border for a science presentation, or just want a simple border to give your presentation a clean and organized feeling. There many types of borders for you create or choose from to match the presentation you are creating. 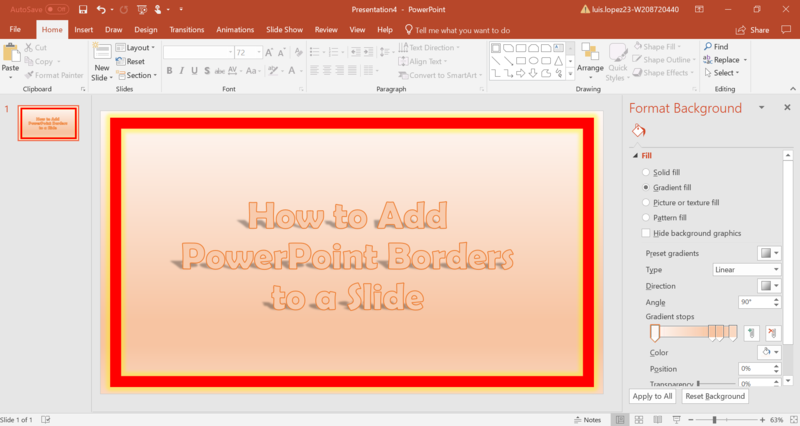 Depending on the version of Microsoft powerpoint that you use will determine how you create your border. 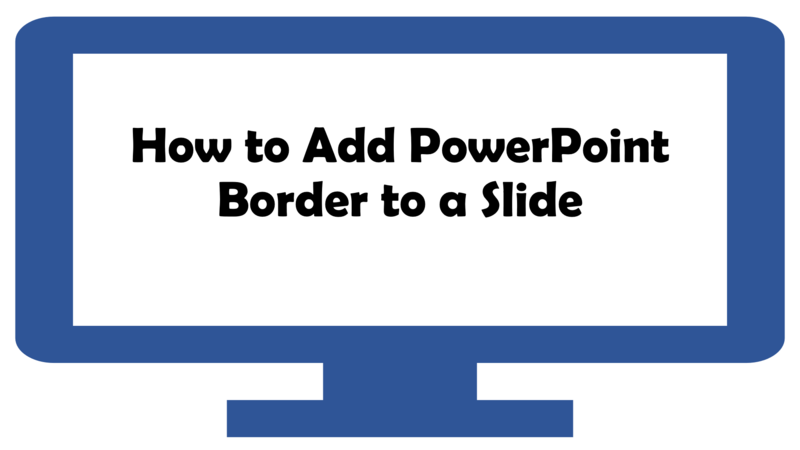 There are 3 ways to create borders for your powerpoint presentation. 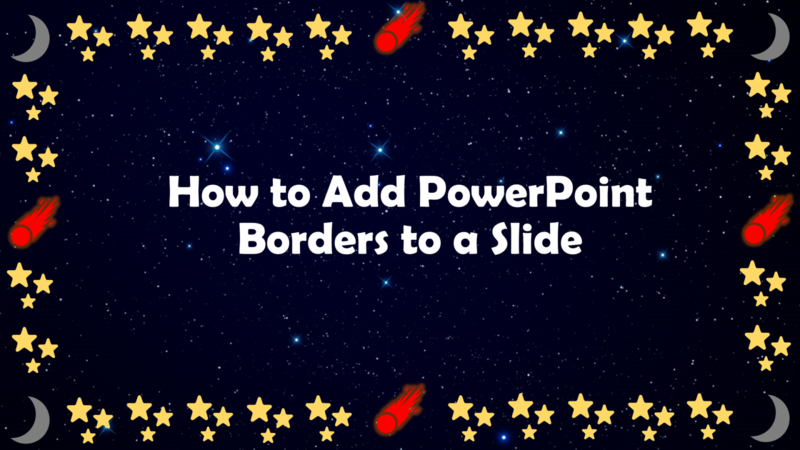 Why use borders in a presentation? 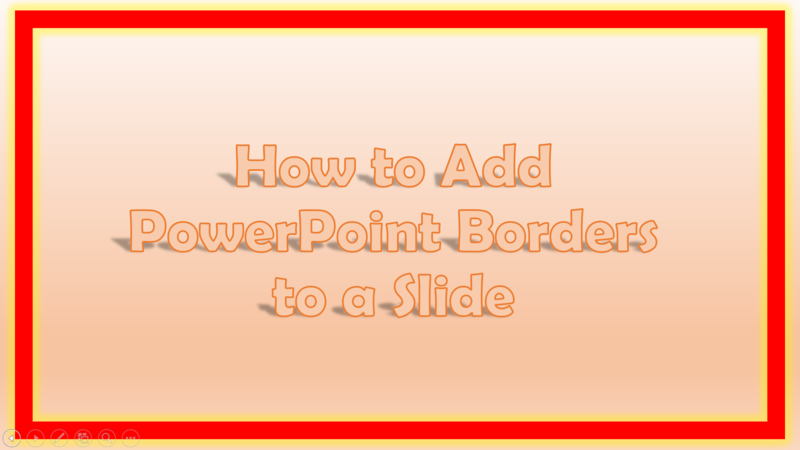 A border on a presentation gives the presentation a more organized and structured look. 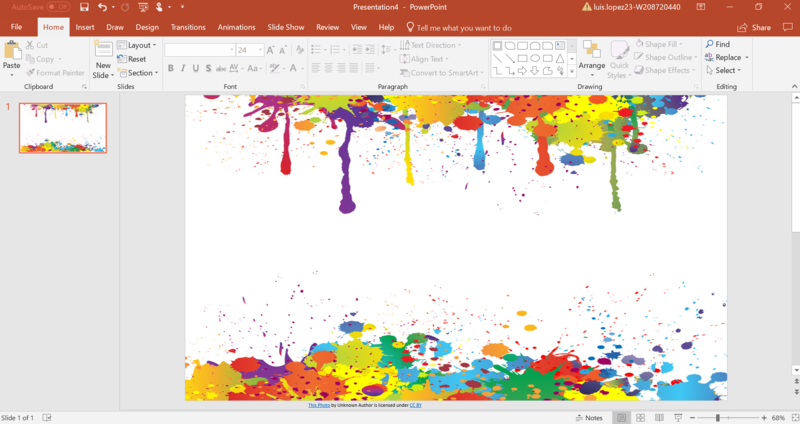 This will give your presentation a more visual appeal, catching the audience’s attention. You border does not have to be something over the top, it can be so something as simple as lines and repeated patterns or could be a balances design and context-based borders. 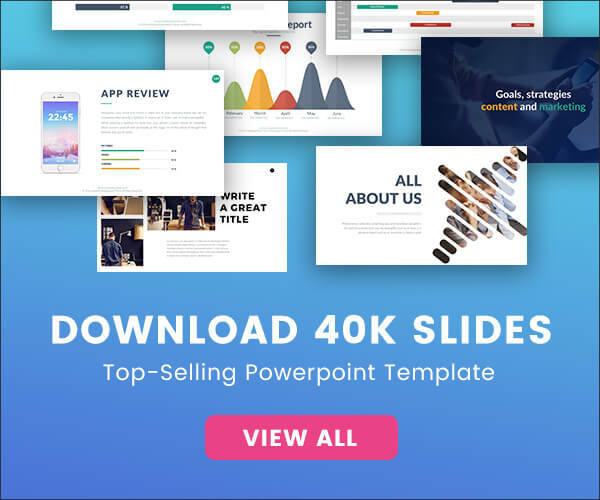 In fact, you can make your border as elaborate as creating a whole background design visually capturing the audience’s attention, but not distracting them from the information you are trying to present to them. 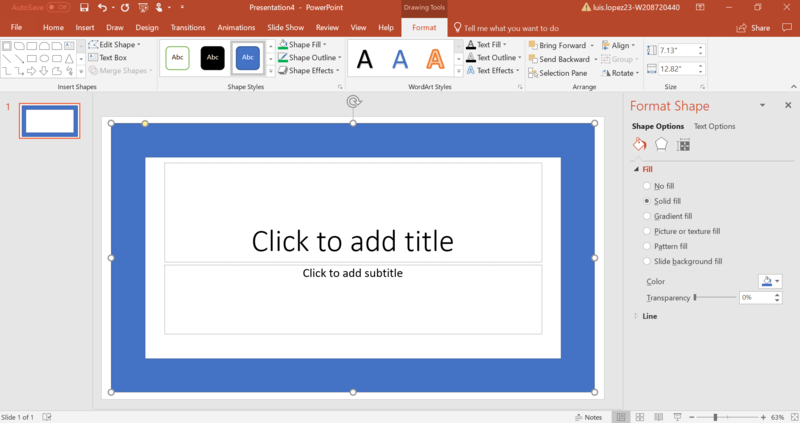 Shape Border is a simple way to add a border, yet it will make you slide stand out. 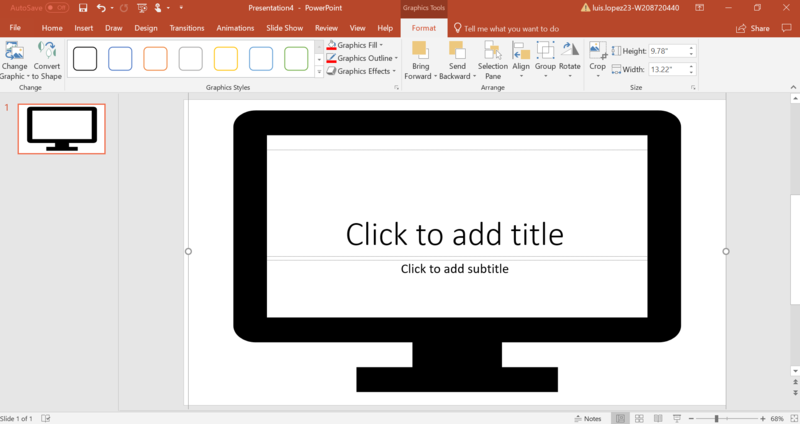 Since this is your Powerpoint presentation, and you are the one who is creating the presentation, you can change the colors and make your design to look however you want. 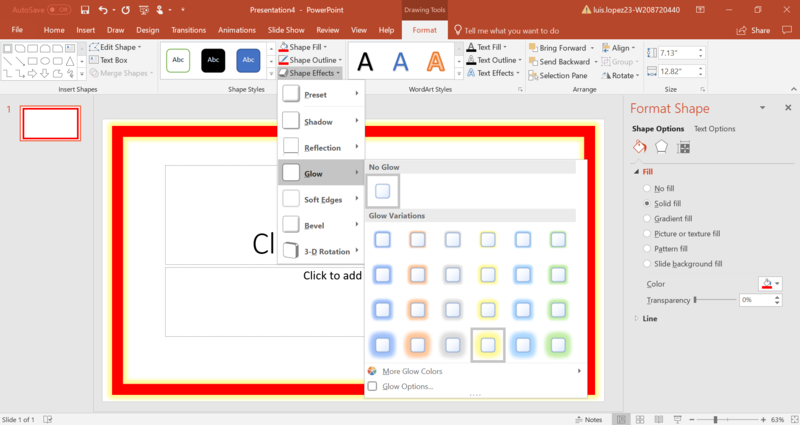 Go to the Insert tab, and locate Shapes. The best shapes to use would be found in the Rectangle Category, but in basic shapes, you can also find frames, so it depends what you looking for. For this example, I’m going to use the Frame shape, that is found in Basic Shapes. As a matter of fact, if you hover each shape, you can see the name each shape. 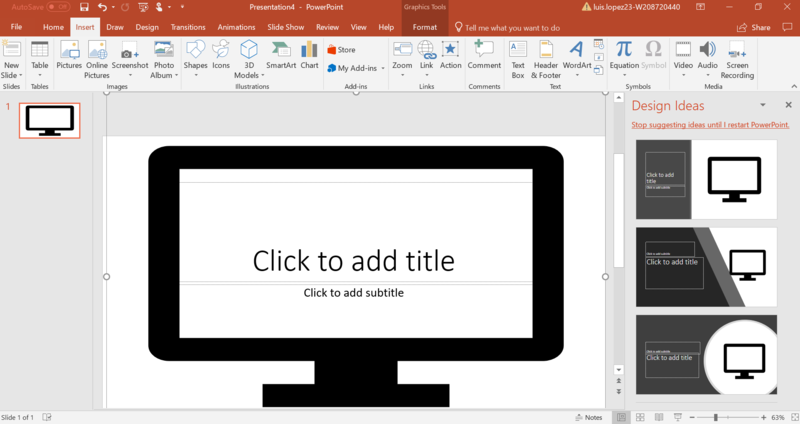 When you have decided on a shape, you are going to get a cursor that looks like a plus sign, and you will create your shape. You can make the shape look however you want. The frame was too thick, so I can change the thickness. 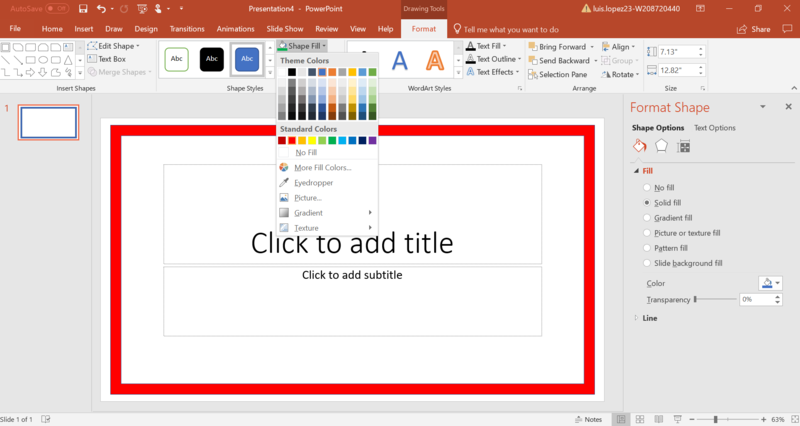 You can change the color of the shape and change the effects, by going to the Format tab and changing the color in Shape Fill. You can also henge the outline and add other effects like, make it look 3-D, add shadows, reflections, add a glow effect, and other features. 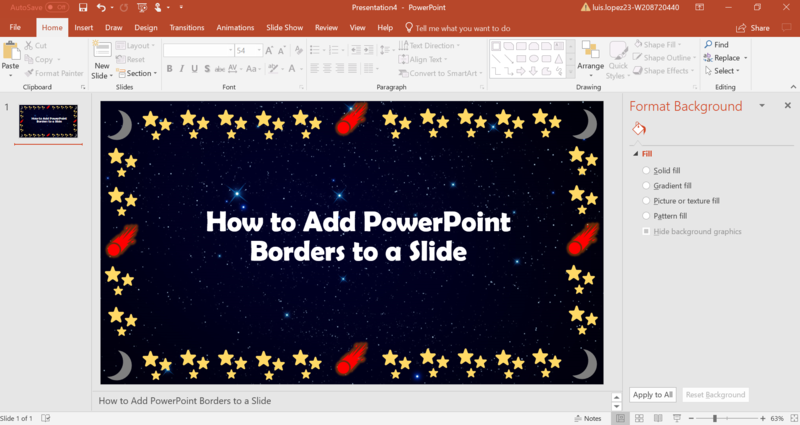 After you have created your border, you can add your information to the slide, and voila! 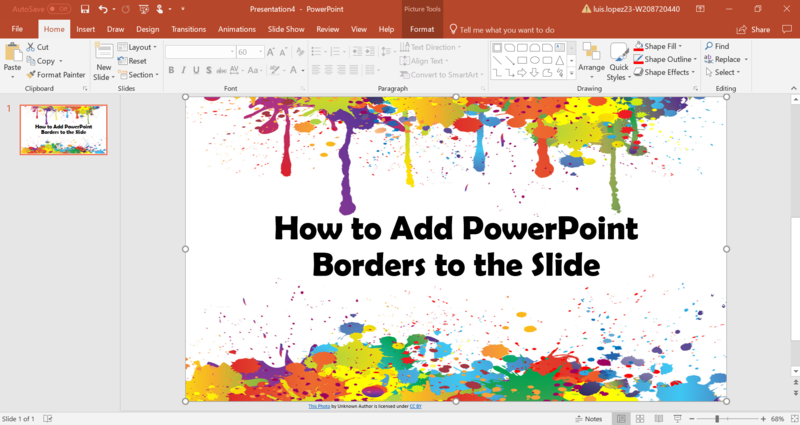 You will create a unique and one a kind slide design. Images are great attention getters! 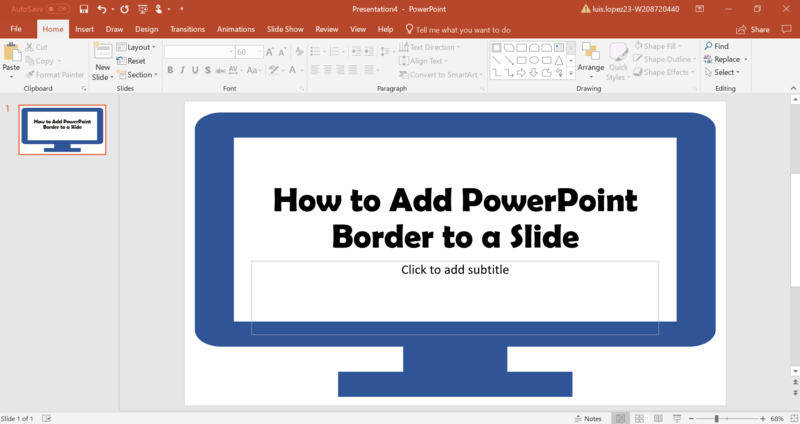 So, why not create a border by using an image to make you slide standout. 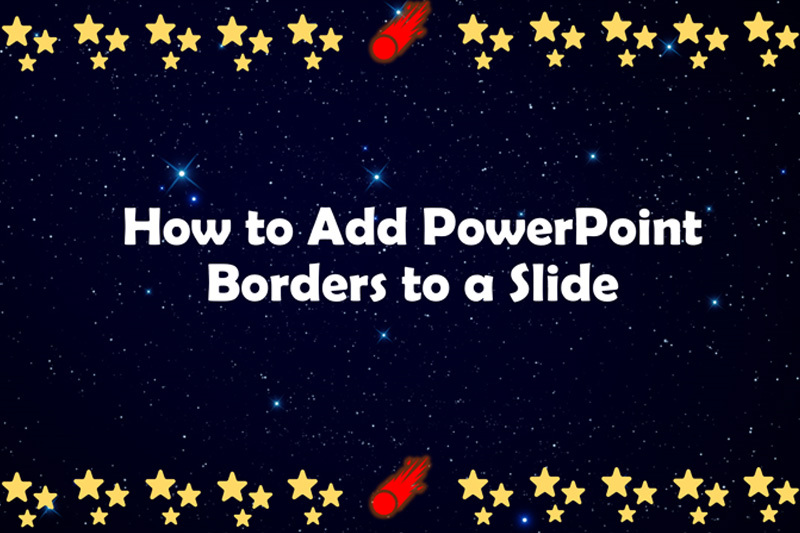 Online you can find a lot of images of borders to choose from, to give your presentation a unique and amazing look. 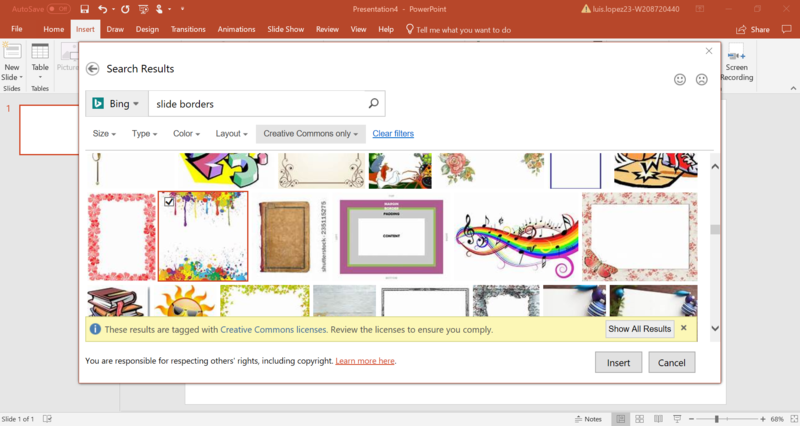 Go to the Insert tab, and locate Online Pictures. 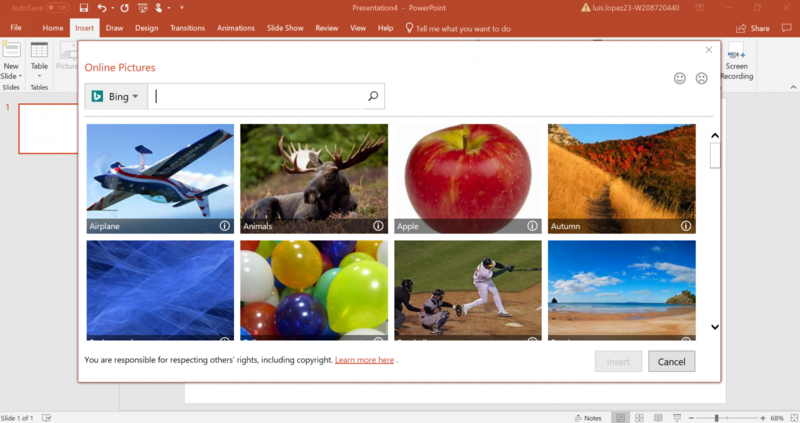 Click on Online Pictures and you will get a Bing pop-up. On the search bar type in Slide Borders, and you will get a variety of borders. 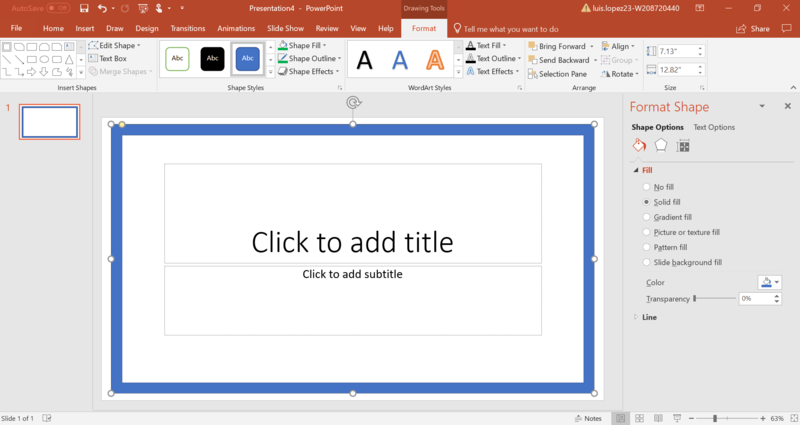 Choose a border then click on Insert. 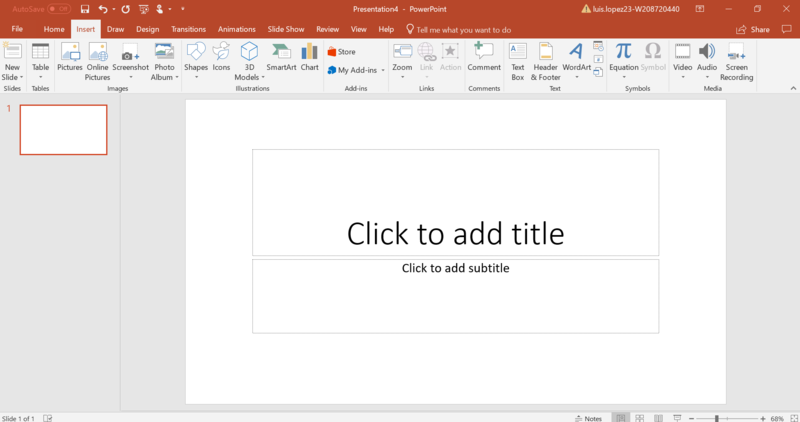 Since it is an image, you may need to expand the image to make it fill the page. 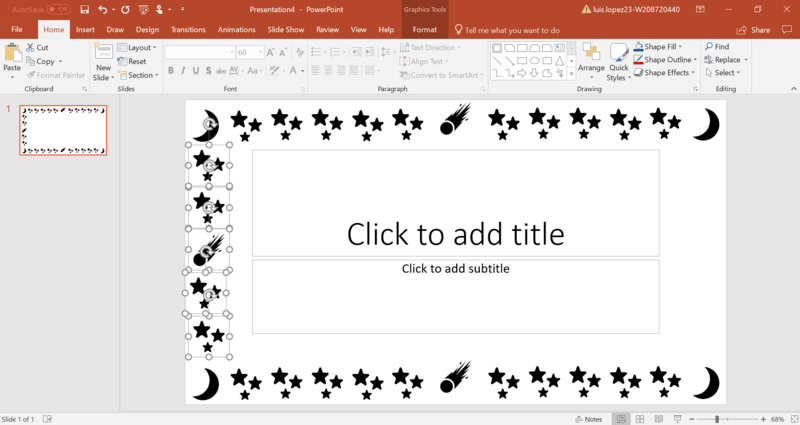 Since you just want it as a border, you can send it all the way back so you can type in your information. All you need to do is right click and look for the option that says Send to Back. 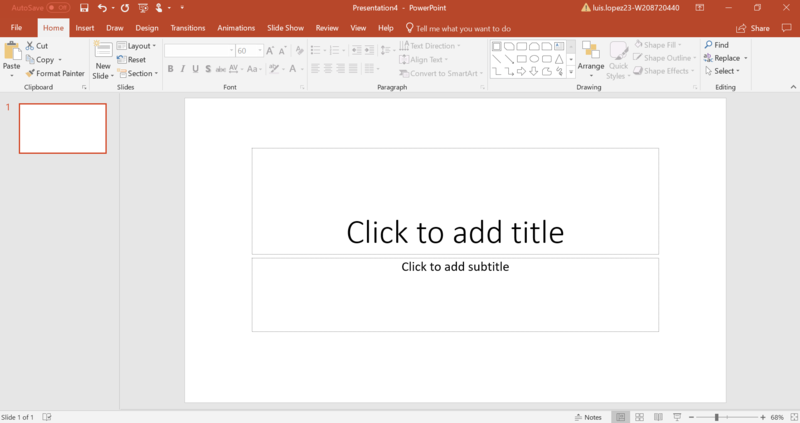 After that, you can add your information to the slide and voila! 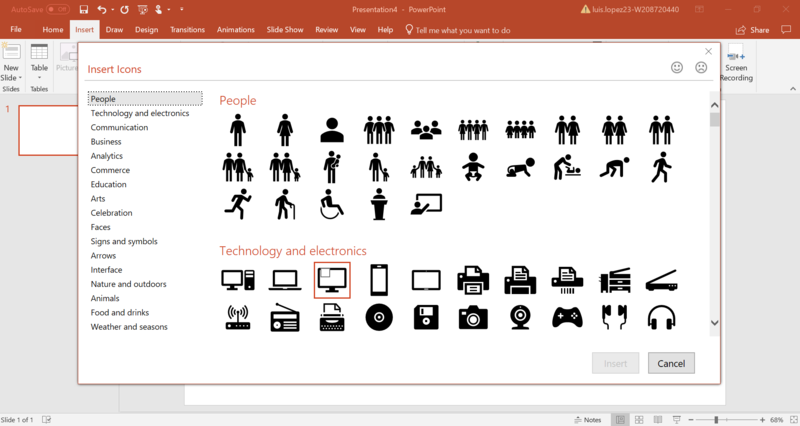 Icons are simple small images that can make your information stand out. Icons are universal and everybody knows about them, which is why with some icons, you can use them to give your information a new look, with a border-like design. 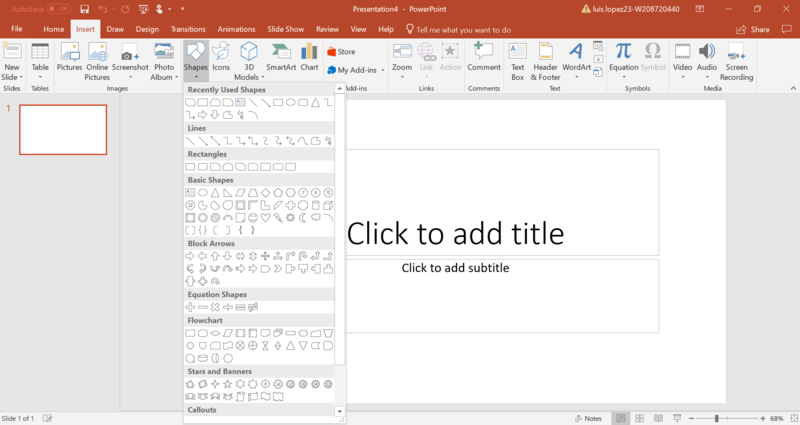 Go to the Insert tab, and locate the Icons tab. Click on Icons, and you will get a pop-up with many icons. When you choose an icon that matches your theme, choose it, and press Insert. 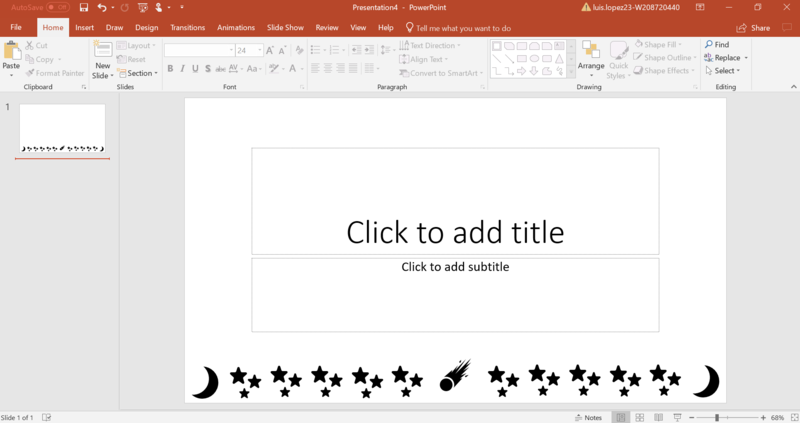 The Icon will be small when its inserted in the slide, so you’ll have to make it big. 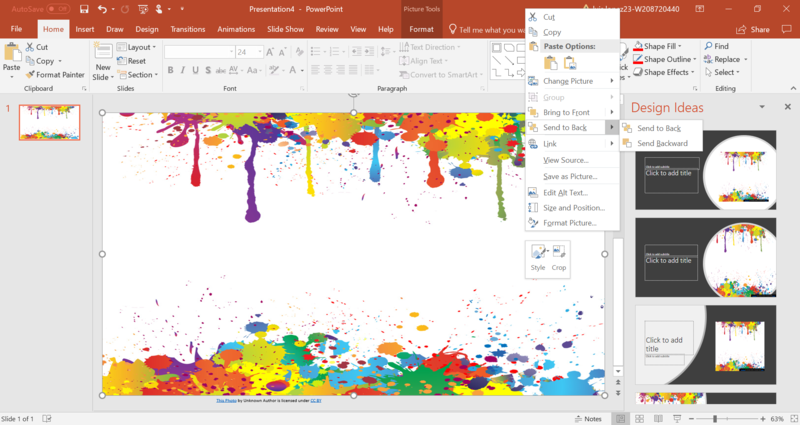 If you want to change the color of the icon, you can go to Format, then to Graphic Fill and choose your color. 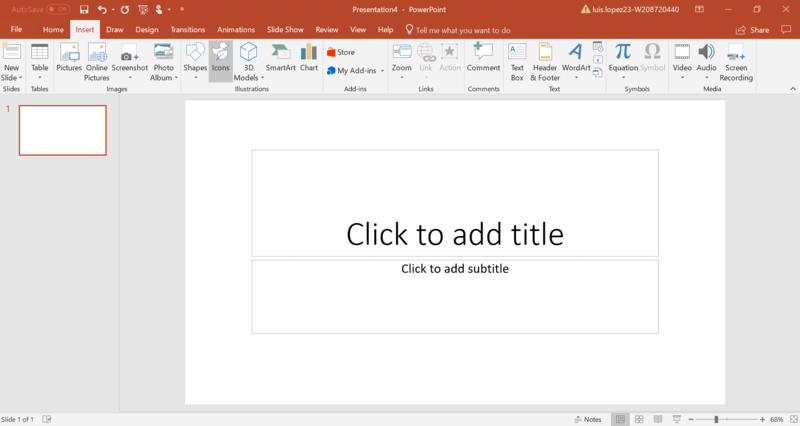 Similar to using an image, to add your information, you are going to need to send the icon to back. So, right click and click on option Send to Back. 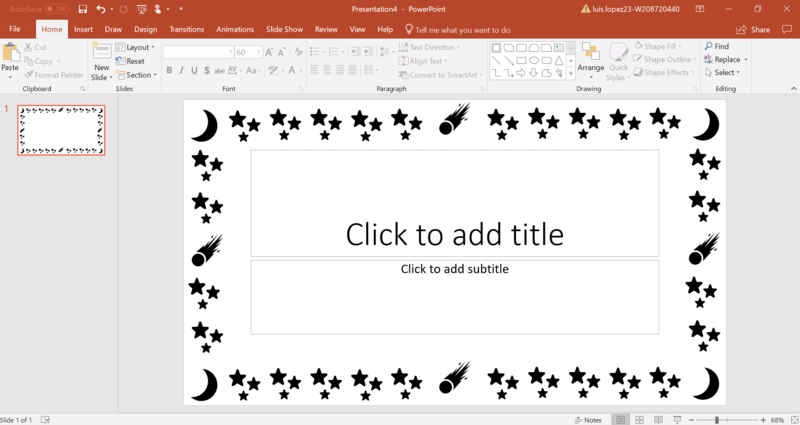 Add your information, and you will be ready to present. 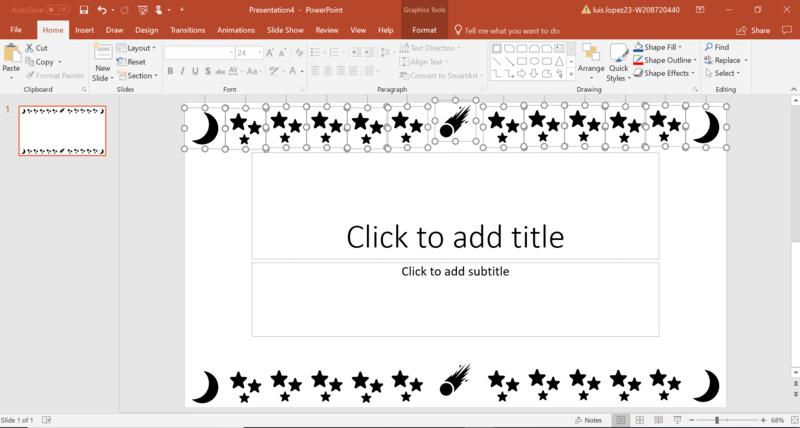 Just like the previous way to make the border, with this technique you will also use Icons. With number three we used one icon, with this one we will use multiple icons, in a pattern or however way you would like your pattern to look. 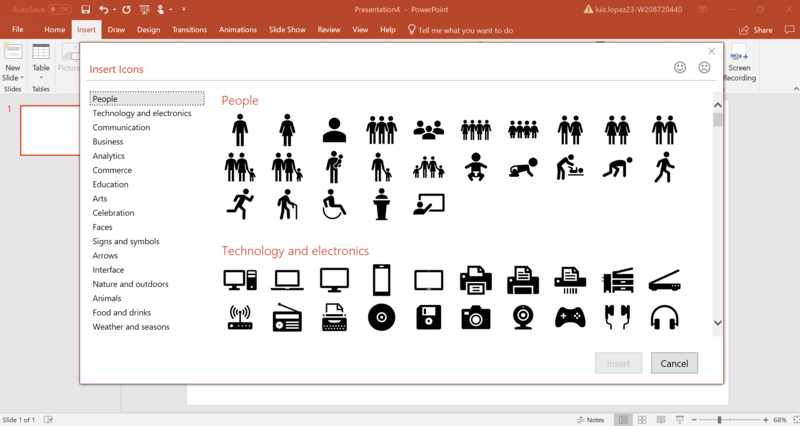 Go to the Insert tab, and locate the Icons. Click on the Icons, and you will get a pop-up with many icons. Once you choose your icon or icons, line them up on the bottom. 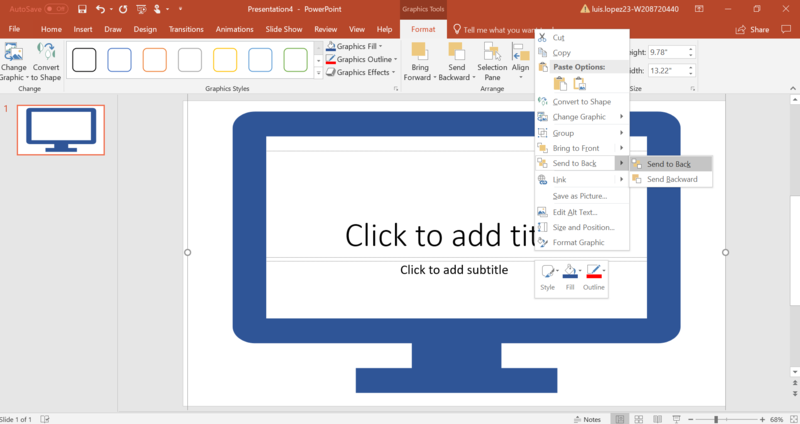 Once you add an icon, you can just copy and paste on the slide to make multiples of the same icon. 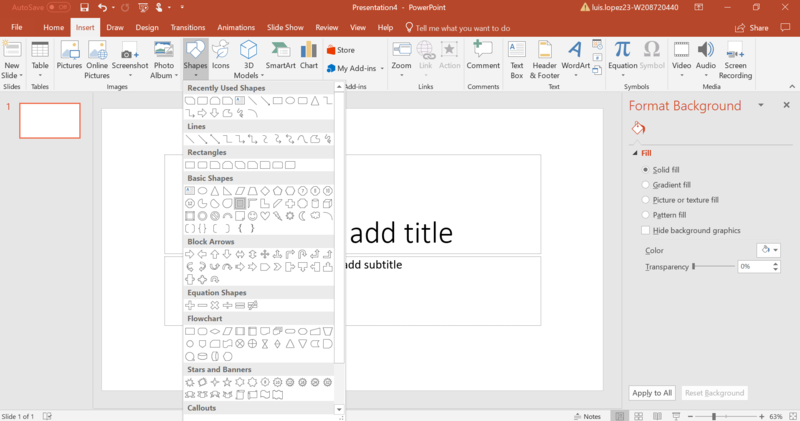 Then, copy the whole icon strand and paste it, then move is to the top to have them look identical on the top as it is on the bottom. Do the same steps 3 & 4, but just along the side. 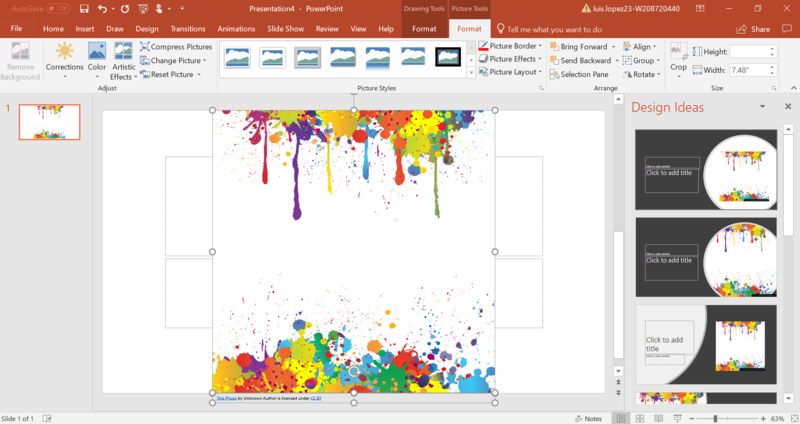 You can change the color while organizing your border, by clicking on the icons, you can choose multiple icons by pressing down on the Shift button and clicking all the images, then going to Format and choosing your color in Shape fill. 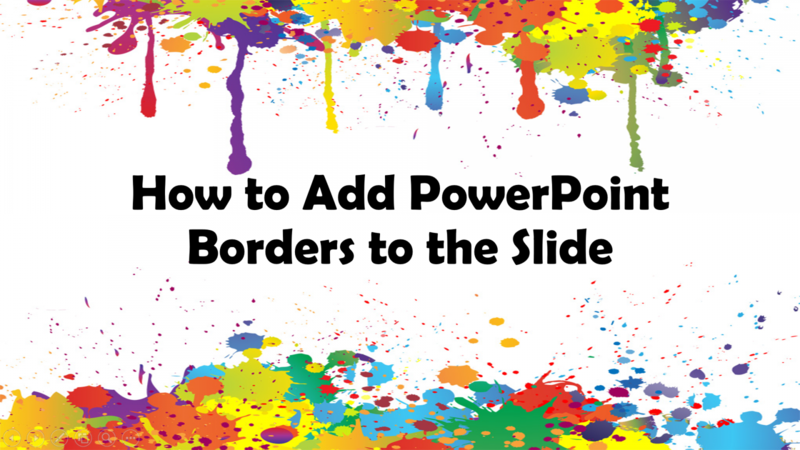 Do anything you want to make your slide stand out and unique, add your information and it will be ready to present.